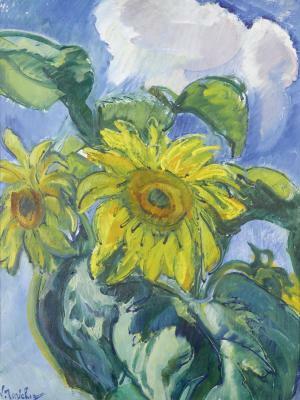 During the 19th and 20th century sunflowers have been a popular subject for many artists. Vincent van Gogh of course being the most well known, depicting the subject many times. Nikolai Tarkhov is a contemporary of Van Gogh, but unlike Van Gogh he depicted the flowers as if the viewer is standing in a field of sunflowers. Tarkhov did not limit the space by depicting the flowers in a vase or room, but creates an open composition with a bright blue sky. The style in which Tarkhov painted the sunflowers can be classified as Post-Impressionist. He quickly captured the moment - one can almost feel the wind blowing through the sunflower field - but uses bright expressive colours. He enlivens the flowers even further by structuring the leaves with bright blue outlines, creating a colourful and expressionist scene. Nikolai Tarkhov was one of the first Russian impressionists. He was born into a wealthy merchant family and studied art independently. In 1897 he met impressionist painter Konstantin Korovin in Crimea, Ukraine, and later worked with him in Korovin's studio in Moscow. Tarkhov debuted in 1899 at the Moscow exhibition World of Art (Mir Iskusstva), after which he moved to Paris where he con . . .